Having a baby is a wonderful thing, but while some mothers look into their newborn's eyes and form an immediate connection, many do not. A new survey shows that as many as a third of new mothers have difficulty bonding with their babies. The survey, carried out by the UK charity the National Childbirth Trust (NCT), spoke to 1,515 new parents, and as well as problems bonding they also found that more than one in 10 new mothers said they were too embarrassed to speak to health professionals about it. Elizabeth Duff, the NCT's senior policy adviser, said: "The bond a baby has with its parents acts as a template that shapes the child's emotions and relationships later in life, so it's a crucial process. Parents who don't feel an instant connection with their new baby often experience strong feelings of guilt, shame and inadequacy. We hope our research reassures new parents that they are not alone if they don't instantly bond with their baby and that this can often take time." Bonding with your baby the moment they are born is supposed to happen automatically. But that is not always the case and it is important that women who don't experience love at first sight with their babies, do not feel isolated and alone. We are bombarded by magazine spreads of celebrity mothers in their hospital beds looking resplendent in frilly nighties gazing adoringly at their babies. But, let's face it, anyone who has actually given birth knows that the reality is very different. No two births are the same, some are relatively straightforward, some are painful and others are just plain awful. The problem is, that no one who is lucky enough to have given birth to a healthy baby wants to be seen to be complaining. In this social media obsessed world of perfect images, you don't want to be seen as the one mother who isn't coping. So women pretend. They fake it. But the problem with faking it is that it only gets worse. If you don't bond with your baby, the guilt will begin to set in, followed by self-doubt and then feelings of failure and shame. Why don't you love your baby as much as Angelina Jolie? What's wrong with you? These negative thoughts and doubts can lead to depression. It is therefore vital that new mothers who are struggling to connect with their newborn know that they are not alone and can talk to someone. They can talk to other mums, either face to face or on online forums, which might be easier if they feel shame. They should also talk to their GP about it. The important thing is not to panic. Bonding is a process, not something that takes place within minutes and not something that has to happen within a certain time period after birth. For many mothers, bonding develops over time as they care for their babies. You may not even notice that it's happening until you see your baby's first smile or they wrap their little fingers around your thumb or stare into your eyes and you're suddenly filled with love and affection. Experts recommend having your baby stay in your room at the hospital from birth to help you bond straight away. They believe that while taking care of a baby can be overwhelming at first, you can benefit from the emotional support provided by the staff and start becoming more confident in your abilities as a parent. 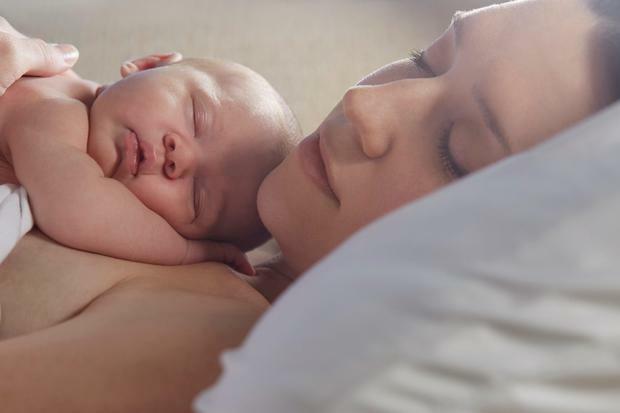 Dr Bart Kuczera, consultant at Beacon CARE Fertility in Dublin, suggests that ways to optimise maternal-newborn interactions should include: skin-to-skin contact right after delivery, immediate breast feeding, "rooming in" and partner's assistance at delivery. "All these actions are aimed at keeping the new mother with her baby together without compromising their safety." More than 95pc of Irish mums are "roomed in" with their babies - a practice which is applied in most Irish maternity hospitals - to help them bond with their babies. But many women feel there is inadequate support from carers to help them bond with their babies and admit that they felt panicked and afraid. AIMS Ireland (Association for Improvements in the Maternity Services Ireland) conducted an online poll to find out what matters to Irish women in terms of maternity care. Fifteen per cent of women listed lack of postnatal support as their main concern in the Irish maternity services. In their replies, women with traumatic deliveries and C sections, who were physically restricted by complications following the birth, described how they were left alone to look after their own and their infant's needs. These women spoke of their distress at being physically incapable of taking care of their infant and how this lack of post-natal support affected them mentally, increasing anxiety, and promoting feelings of loneliness and failure that often had a lasting impact on them. Bonding is a complex, personal experience that takes time. There's no magic formula and it can't be forced. Mothers mustn't beat themselves up if they don't connect with their babies straight away. A baby whose basic needs are being met won't suffer if the attachment isn't strong at first. As you become more comfortable with your baby and your new routine, you will start to feel more confident and relaxed and will then be able to bond more. Don't forget, you're a mother for life, so there is no need to rush it. As for the guilt, we all beat ourselves up far too much. All you can do is your best.